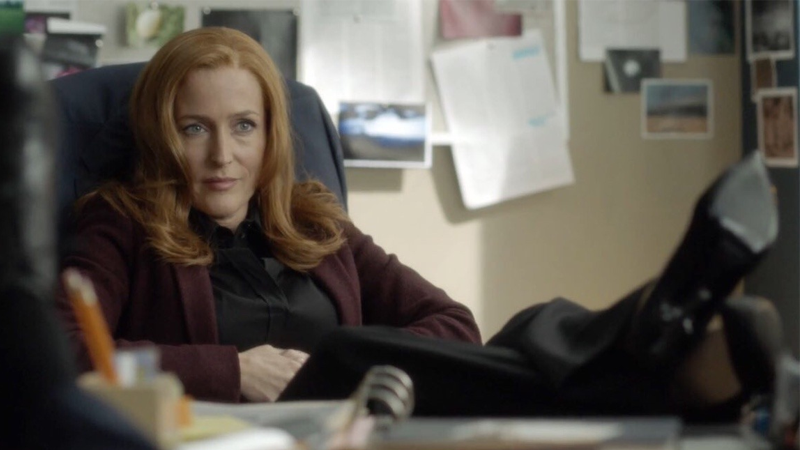 Gillian Anderson as Special Agent Dana Scully, wearing the face of a woman who is really, really done with all this. Just as showrunner Chris Carter had warned it would, Gillian Anderson’s exit from The X-Files after its 11th season has led to Fox confirming there are currently no plans to continue the series. But Anderson has weighed in with her own thoughts as to why The X-Files season 12 is a no go. Speaking to reporters in a conference call today (after several big renewal and cancellation announcements for the network), Fox CEO Gary Newman confirmed that “there are no plans to do another season [of The X-Files] at the moment,” presumably due to the fact that Anderson, one of the show’s main stars, made it clear the 11th season would be her last. Controversially, that season ended with Scully not only seemingly losing her kinda sucky son William (who, it turns out, was conceived by the machinations of the Cigarette Smoking Man, and not Mulder), but revealing that she was pregnant with Mulder’s child. While Fox seemingly has hopes for the show’s future—after all, Newman did say the network didn’t have plans “at the moment”—given Anderson’s candid reaction to where Scully’s storyline has gone in the show, any immediate future for X-Files will be without her. And if you don’t have Scully herself on board, why even do it?